KISS and DevOPS methodology fan. Give him coffee and containers and he would be happy. Always open to new opportunities and projects. Because I do not find any interesting project that easily ship Apache Jmeter inside Kubernetes. Yes, there are a few concepts but each required to run 5-10 scripts to run test. I decided to create home project that ship jmeter via helm chart in to kubernetes. All required code was published on github kuberentes-jmeter. Master and slaves are located on vms or bare metal machines. There are connected to your kubernetes cluster. Unfortunately this case would be difficult when you would like to test some internal components not exposed outside cluster (possible but additional configuration of ingress or port forwarding required). Master on your local station / vm. Slaves run inside kubernetes. This would allow you to easily use Jmeter master UI but still this is not enough for long testing or testing automation. 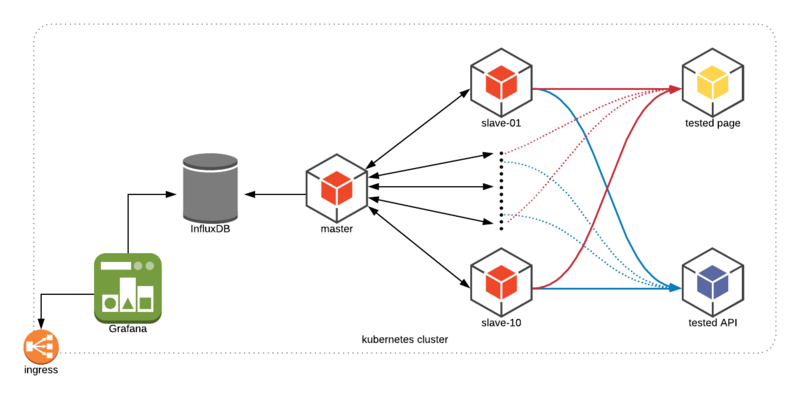 Master and slaves ship to kubernetes and run on demand (kubernetes-jmeter) is deployed this way. Grafana and InfluxDB instances, there is possibility to use own metric aggregation stack. When everything is deployed from the kubernetes-jmeter chart by default Grafana and InfluxDB pods are also deployed in the same namespace as jmeter. Below there is a example run inside minikube. That deploy the whole stack with Grafana and InfluxDB instance inside default namespace. There is possibility to provide custom value yaml with -f flag. The command deploys Jmeter on the Kubernetes cluster in the default value yaml. If you change deployment name (-n test) please update Grafana datasource influx url inside your custom values.yaml files. Kuberentes-jmeter could be deployed without Grafana and InfluxDB. Useful when the metric collection stack is already deployed. Services deployed to default namespace. Jmester master deployment scheduled test-jmeter-master but tests need to run manually. By default jmeter run in manual mode, all test need to be trigger by operator or additional service like jenkins job. If tests are loaded from config map, the jmeter master could run them automatically. In this case chart attribute oneShotTest need to be set to true. This project is done during my spare time so each new feature, bugs fixing is done when I have a one or two hours of spare time. If you see that something could be fixed or changed create an issue or pull request.